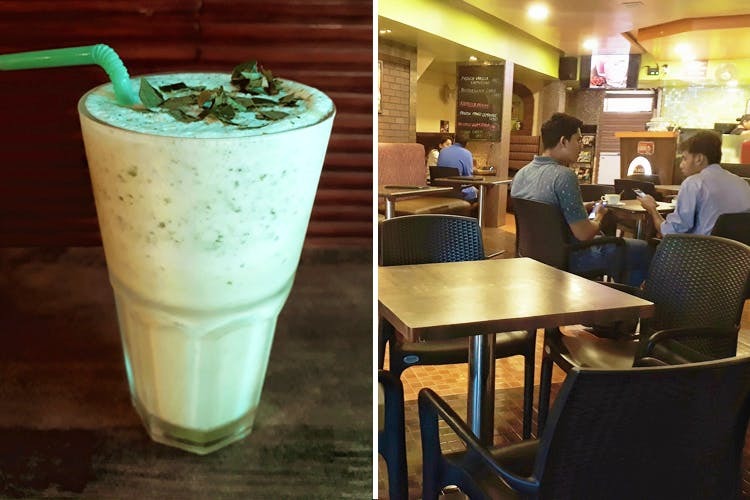 #LBBPicks: Have You Tried The Cool Green Paan Shake From Cafe Milano? Don’t just chew on Varanasi special meetha paan, drink it too! Yes, you saw that right. Milano at Clover Corner in Viman Nagar is giving our age-old mouth freshener with an awesome twist! Behold the exotic paan shake, an unique creation by Cafe Milano. This striking drink in cool sea-foam hue is a major hit at the cafe, especially during the summers. Albeit, this doesn’t mean you can’t relish this beauty on a rainy afternoon or a wintry evening. The paan shake is a combination of betel leaves, vanilla ice cream, milk, ice and an additional paan flavouring agent. So the next time you’re at Milano’s, don’t forget to order this startling one-of-a-kind drink for just INR 120. Paan shake is literally a super cool drink with an instant soothing and refreshing after-effect. We also loved Milano’s forest fruit shake for INR 130 and the peanut-butter banana shake for INR 150.